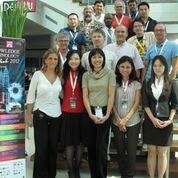 The 2012 edition of the AOS workshop took place in Kutching, the capital of the Sarawak region in Malaysia. The workshop was co-organized by FAO, MIMOS, and CAAS (the Chinese Academy of Agricultural Science) in the persons of Dr. Caterina Caracciolo, Michelle Lim and Xuefu Zhan, and was co-located with the Knowledge Technology Week, a large annual event organized by MIMOS Berhad. This year AOS focussed on practical, semantically-based applications in information management for agriculture, and featured some 20 presentations distributed in two days. In line with the tradition of the AOS workshops, good time was devoted to discussions and panels. The workshop was opened by the invited speech delivered by Prof. Andreas Dengel from DFKI, who talked about the use of mobile services in agriculture, and discussed the experience of the iGreen project . The iGreen project discussed the role of semantic technologies to improve production forecast and logistic optimization in farming. During the workshop, a number of applications and projects were presented, to which semantically-enabled software and technologies are central: an herbal medicine knowledge-based system, the igreen project mentioned above, a system for social question answering in agriculture, a knowledge based for agricultural intensification built as an extension of AGROVOC, a system for business matching based on semantically enable knowledge base, an AGROVOC plug in for Dspace, an extension of VIVO for the domain of agriculture, and a system for semantic annotation of agricultural documents. Other works concentrated on issues related to maintenance and encoding of vocabularies, and to their conversion into Linked Datasets. Much of the work presented used AGROVOC as an underlying knowledge base, and also several works were based on the Chinese Agricultural Thesaurus. streams of RDF triples created from legacy information systems, to be re-used by third parties and service providers. The need for high quality tools for data processing was also discussed. Ideally, these tools should be delivered as cloud services to take away the burden from small institute to install and maintain information technology. The final panel at the end of the workshop also confirmed these lines of development for the future, with participants agreeing on an increasingly important role of linked data and related technologies for the management of agricultural information. A selection of the papers presented at the workshop will be collected in post-proceedings and published by Springer.